Active transport is the movement of molecules up their concentration gradient , using energy. The concentration of most molecules inside a cell is different than the concentration of molecules in the surrounding environment. The plasma membrane separates the internal environment of the cell from the fluid bathing the cell and regulates the flow of molecules both into and out of the cell. The second law of thermodynamics states that molecules, whether in the gas or liquid state, will move spontaneously from an area of higher concentration to an area of lower concentration or down their concentration gradient. A concentration gradient can be likened to water stored behind a dam. The water behind the dam will flow through the dam via any available channel to the other side. The energy from the water moving through the dam can be harnessed to make electricity. Water can also be pumped in the opposite direction from the river below the dam up to the reservoir behind the dam, with an expenditure of energy. Cellular membranes act somewhat like a dam. They block the movement of many types of molecules and have specific channels, transporters and pumps to provide pathways for the movement of certain molecules across the membrane. When a molecule moves down its concentration gradient using one of these membrane channels or transporters, the process is called facilitated diffusion. In facilitated diffusion, no input of energy is needed to move the molecules. Instead, the potential energy of the concentration gradient powers the movement, just like water flowing out of a dam. For further diffusion, the channel or transporter does not determine in which direction the molecules will move, it only provides a pathway for the movement. Diagram of carrier protein, which actively pumps Na + out of and K + into a cell. For every molecule of ATP hydrolyzed inside the cell, three Na + are pumped out and two K + are pumped in. membranes must concentrate some molecules against their concentration gradients. There are three types of active transporters in cells: (1) Coupled transporters link the "downhill" transport of one molecule to the "uphill" transport of a different molecule; (2) ATP -driven pumps use the energy stored in adenosine triphosphate (ATP) to move molecules across membranes; (3) Light-driven pumps use the energy from photons of light to move molecules across membranes. Light driven pumps are found mainly in certain types of bacterial cells. Most of the energy expended by a cell in active transport is used to pump ions out of the cell across the plasma membrane. Because ions have an electrical charge, they do not easily cross membranes. This phenomenon allows large ion concentration differences to be built up across a membrane. Highly selective transporters are present in membranes that pump certain ions up their concentration gradients, but ignore other ions. The NA + -K + Pump. One of the best understood active transport systems is the sodium-potassium pump, or NA + -K + pump. This carrier protein is a coupled transporter that moves sodium ions out of the cell while simultaneously moving potassium ions into the cell. Because of the pump, the sodium ion concentration inside the cell is about ten to thirty times lower than the concentration of sodium ions in the fluid surrounding the cell. The concentration of potassium ions inside the cell is almost exactly the opposite, with a ten-to thirtyfold higher concentration of potassium ions inside the cell than outside. 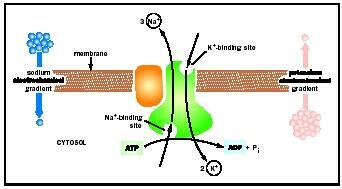 Because the cell is pumping sodium from a region of lower concentration (inside) to a region of higher concentration (outside), the NA + -K + pump must use energy to carry out its pumping activity, and this energy is supplied by ATP. For this reason, the NA + -K + pump is also considered an enzyme . It belongs to a class of enzymes known as ATPases that use the energy stored in ATP to carry out another action. Other membrane transporters use the energy from ATP to pump ions like calcium, amino acids , and other electrically charged molecules either into or out of the cell. Ions carry a positive or negative electrical charge so that these gradients have two components: a concentration gradient and a voltage or electrical gradient. For instance, sodium ions are positively charged. The higher concentration of sodium ions outside of the cell than inside means that outside of the cell will have a positive charge and the inside of the cell will have a negative charge. This potential difference, or voltage, across the membrane can be used as an energy source to move other charged molecules. Positively charged molecules will be attracted towards the inside of the cell and negatively charged molecules will be attracted to the outside of the cell. It is, in fact, this electrical potential that causes positively charged potassium ions to enter the cell through the Na-K pump, even though they are moving up their concentration gradient. The potential energy of the gradient can be used to produce ATP or to transport other molecules across membranes. One of the most important uses of the NA + gradient is to power the transport of glucose into the cell. The NA + -glucose cotransporter moves sodium down its concentration gradient, and glucose up its gradient, as both move into the cell. what does it mean to say that cell membrane pumps work agaisnt the concentration gradient? This article is very helpful and informative for me. it tells a lot of knowledge about the Concentration Gradients. thanks for sharing this with us.